Another year has come and gone, and like many people, I find myself looking back at some of the highlights of 2011. It was a busy year that saw lots of changes in how small businesses work and market themselves. Social media became one of the primary tools used by small businesses, and mobile tools were starting to show up more and more. In addition, the ease of access and low cost of new business applications allowed small businesses to operate in a way that used to be reserved only for the largest companies in the world. With this in mind, it's no wonder that when we asked recently, 69% of respondents said they consider app integrations with Constant Contact to be important to their businesses. And in fact, 76% of respondents said that they use integrations at least monthly; 47% use them at least weekly. As a result, it's safe to say that small businesses are becoming increasingly reliant on additional technology and software tools to develop and promote themselves. For example, we saw huge adoption of social media integrations last year. In 2010, 27,000 customers used social integration products. A year later, that number shot up to 72,000. That’s an increase of over 160%. Our Facebook Join My Mailing List application alone has generated millions of new email subscribers for small businesses, and there are many other social media applications that are seeing growth and adoption. Nonprofits saw growth too in terms of app adoption. Donor management software products are now easier to get access to and use, and we’ve seen Constant Contact customers leading the charge to modernize their organizations. In 2011, more 1,600 nonprofits started to use a new integration with a donor or faith management system. That represents an increase of 113% over last year. We continue to see nonprofits become early adopters of technology and lead the way for small businesses. Over the past year, mobile apps quietly showed big growth as well. While most people focus on the changes that Facebook and Twitter are having on how small businesses can do business, mobile has completely changed the way small businesses are connected to both the world and their customers. Two years ago, 31,000 Constant Contact customers were using a mobile app that was integrated with Constant Contact. This year, that number is up to 64,000 users. That’s a not-so-modest 109% increase in users, despite the fact that most experts are saying we’re still 1–2 years away from mobile being mainstream for small businesses. 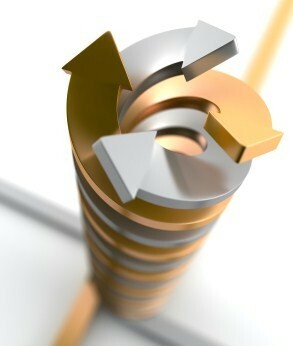 It’s clear that 2011 was a year of change and growth for Constant Contact customers. The way they do business has changed radically with all of the new technologies and products available. It’s truly inspiring to see that our customers are instead embracing these changes to help grow their business. Are you using apps that integrate with Constant Contact? What app integrations would you like to see in 2012? Share your thoughts with us here or on our Facebook Page.